Halliburton Detention Camps For Political Subversives! In another shining example of modern day corporate fascism, it was announced recently that Halliburton subsidiary Kellogg, Brown and Root had been awarded a $385 million dollar contract by Homeland Security to construct detention and processing facilities in the event of a national emergency. The language of the preamble to the agreement veils the program with talk of temporary migrant holding centers, but it is made clear that the camps will also be used "as the development of a plan to react to a national emergency." Discussions of federal concentration camps is no longer the rhetoric of paranoid Internet conspiracy theorists, it is mainstream news. 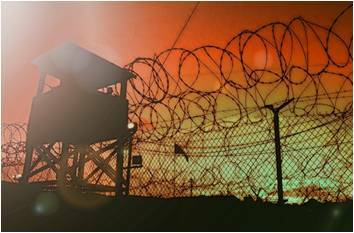 Under the enemy combatant designation anyone at the behest of the US government, even if they are a US citizen, can be kidnapped and placed in an internment facility forever without trial. Jose Padilla, an American citizen, has spent over four years in a Navy brig and is only just now getting a trial. In 2002, FEMA sought bids from major real estate and engineering firms to construct giant internment facilities in the case of a chemical, biological or nuclear attack or a natural disaster. Okanogan County Commissioner Dave Schulz went public three years ago with his contention that his county was set to be a location for one of the camps. 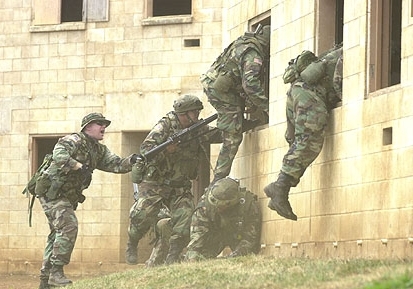 The move towards the database state in the US and the UK, where every offence is arrestable and DNA records of every suspect, even if later proven innocent, are permanently kept on record, is the only tool necessary to create a master list of 'subversives' that would be subject to internment in a manufactured time of national emergency. The national ID card is also intended to be used for this purpose, just as the Nazis used early IBM computer punch card technology to catalogue lists of homosexuals, gypsies and Jews before the round-ups began. Section 44 of the Terrorism Act in Britain enables police to obtain name and address details of anyone they choose, whether they are acting suspiciously or not. Those details remain on a database forever. To date, 119,000 names of political activists have been taken and this is a figure that will skyrocket once the post 7/7 figures are taken into account. At the height of the Iraq war protests, around a million people marched across the country. However, most of these people were taking part in a political protest for the first time and as a one off. Even if we take a figure of half, 500,000 people being politically active in Britain, that means that the government has already registered around a quarter of political activists in the UK. In truth the number is probably above half because we are not factoring in those already on MI5 'subversive' lists and those listed after the 7/7 bombings, when the powers were used even more broadly. 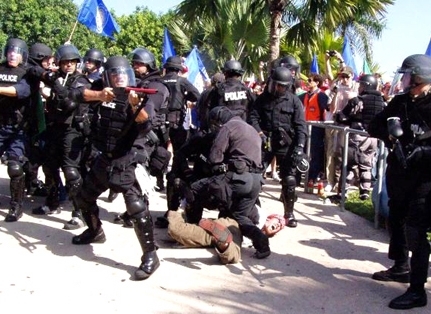 Concurrently in the US, a new provision in the extended Patriot Act bill would allow Secret Service agents to arrest and jail protesters accused of breaching any security perimeter, even if the President or any other protected official isn't present. The definition of 'free speech zones' can be shifted around loosely and this would open the floodgates for protesters to be grabbed and hauled away in any circumstance at the whim of the Secret Service. 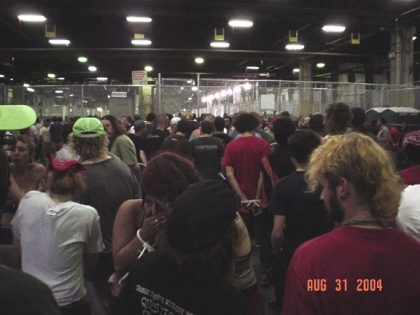 During the 2004 RNC protests, thousands of New Yorkers were arrested en masse in indiscriminate round-ups and taken to Pier 57 (pictured), a condemned, asbestos poisoned old bus depot, where they were imprisoned without charge for up to 24 hours or more. The existence and development of internment camps are solely intended to be used to round up en masse and imprison 'political dissidents' (anyone who isn't prepared to lick government boots) after a simulated tactical nuke or biological attack on a major US or European city. Get Alex Jones' and Paul Joseph Watson's books, ALL Alex's documentary films, films by other authors, audio interviews and special reports. Sign up at Prison Planet.tv - CLICK HERE. Wake up everybody! Why are the churches silent? I keep hearing Christians saying foolish things like "Satan must run his course," others just calling me a "nut" or an "embarrassment" to Christianity. 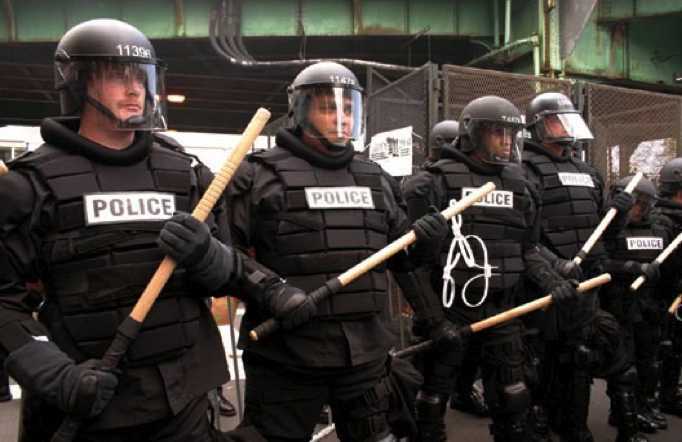 What is it going to take to wake people up, a militarized police state where preachers will be imprisoned for propagating hate speech, for preaching the Bible against homosexuality and sin? What will it take? Are you just going to hand over your firearms to the government, a violation of your 2nd Amendment Bill of Rights? Already, Anti-hate speech legislation has been passed in Canada and is now before congress here in America. Folks, freedom isn't free. And by the way, Democracy is NOT Freedom. You need to believe some of the things you hear. 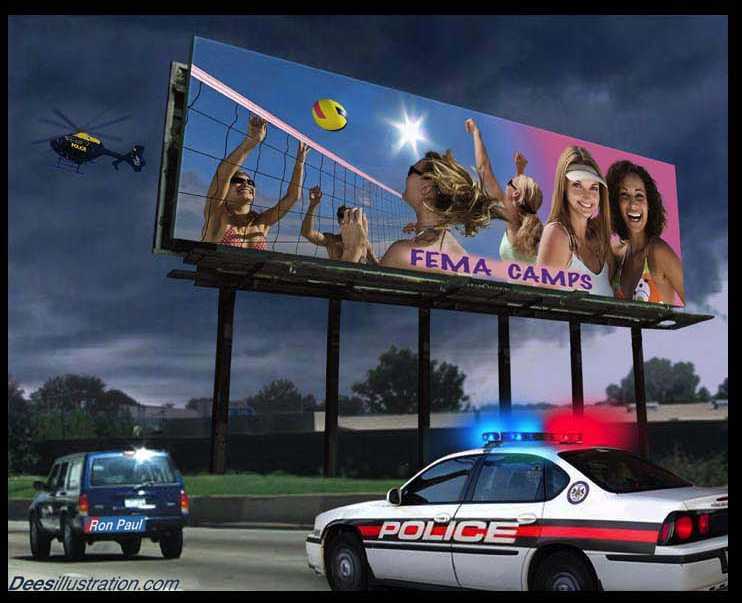 New Legislation"H.R.645"Authorizes FEMA Camps In U.S.
No, concentration camps, and other countries will have them prepared also. Might? It's a certainty because that's the plan and all the laws are in place to allow them to do it. They have been passed by governments around the world as 'anti-terror' legislation, but they use the terms 'terror' and 'terrorist' in such a non-specific way that all these laws can be applied to the entire population of the country that the 'laws' were supposed to protect according to their advocates. Add to all this a stream of presidential executive orders signed by successive presidents without oversight by either the House of Representatives or the Senate. These are unconstitutional and make the president a virtual dictator. Allows the Federal Emergency Preparedness Agency to develop plans to establish control over the mechanisms of production and distribution, of energy sources, wages, salaries, credit and flow of money in the U.S.A. financial institution in any undefined national emergency. It also provides that when a state of emergency is declared by the President, Congress cannot review the action for six months. This is why Obama's Zionist Svengali, the White House Chief of Staff Rahm Emanuel, is seeking to have gun ownership curtailed - to make the military takeover easier. Congresswoman Says America Run by Criminal Syndicate!